A while ago I posted on this topic using reversed-phase columns. Since then I have been asked to address this issue with normal-phase silica columns to answer today’s question: How do particle size and flow rate affect normal-phase flash column chromatography? Because the separation mechanisms between normal- and reversed-phase are different (adsorption/desorption vs. partition), it really isn’t a bad idea to ask the question – do the variables particle size and flow rate play the same roles and have the same impact as in reversed-phase? The chromatographer in me says of course they do, but let’s test this hypothesis and show the data. To generate these data, I created an isocratic method using 80% hexane and 20% ethyl acetate. My flash chromatography system is the brand new Biotage® Selekt, and to generate the separation, I used both 20 µm and 60 µm spherical silica packed in the new 5 gram Biotage® Sfär column design. My sample was a 1:1 mixture of methyl (100 mg/mL) and butyl paraben (100 mg/mL) dissolved in acetone. Detection was UV photo-diode array (all wavelengths between 200 and 400 nm). To keep detector response on scale for the experiments, I kept my injection volume low (0.1 mL). Flow rates were changed between runs and included 5 mL/min, 10 mL/min, 15 mL/min, 20 mL/min, and 25 mL/min. Compound retention and peak width were measured by hand (anybody remember doing this?) and resolution calculated based on these values. Resolution impacts both load capacity and fraction purity, more resolution = more separation = higher purity/higher loading capacity, Table 1. As I have previously posted, when it comes to solvent flow rates it is important to think (and scale-up) in terms of linear velocity in order to equate the flow between different column sizes. The data shown in Figure 1 is a compilation of the chromatographic runs using the 60 µm media. From these data, you can clearly see that as flow rate (linear velocity) increases, the separation (resolution) between the parabens decreases from a high of 1.08 down to a low of 0.64 (or 41%). Figure 1. 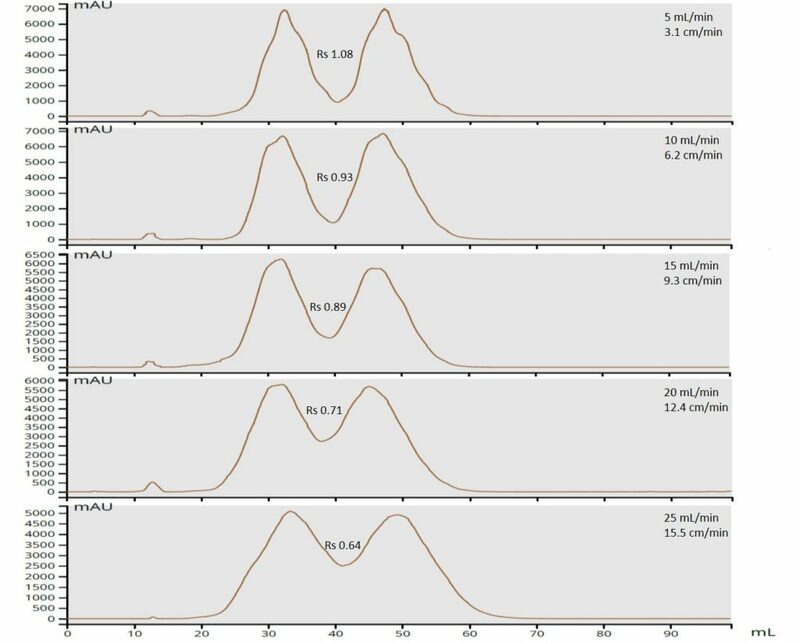 Chromatograms created using a 5 gram, 60 um silica column with a mobile phase of 80:20 hexane/ethyl acetate show a big resolution decrease (and increased peak diameter) with increasing flow velocity. However, with the smaller 20 um silica the resolution decrease is far less dramatic as flow increases, only decreasing from 1.41 to 1.24 (or 12%), Figure 2. Figure 2. 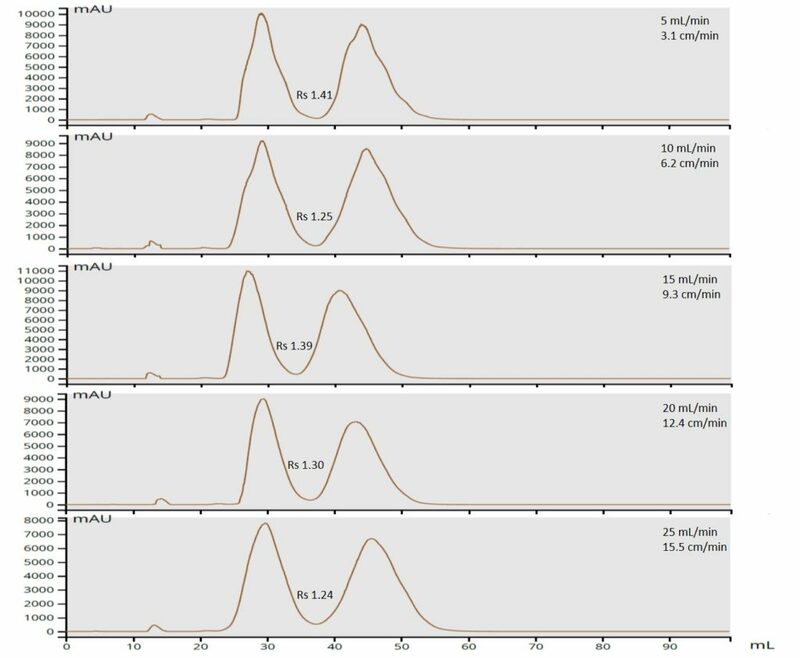 Chromatograms generated using 5 gram, 20 um silica columns isocratically in 80:20 hexane/ethyl acetate show minimal resolution change with increased flow rate. What these data ultimately show is that with smaller diameter particles you can achieve essentially the same separation regardless of flow velocity. This is quite important since the ability to increase flow rate (without much risk to fraction purity) reduces purification time and solvent consumption (more sample load per gram of silica with smaller particles). Data also show that with larger particle media, solvent flow velocity and sample load should be reduced in order to maximize compound resolution (load/purity). So, when using flash purification and want to maximize throughput by increasing flow rate and sample load (while reducing solvent), you should consider using small particle, high surface area silica columns at elevated flow velocities. For more information on flash chromatography, I invite you to listen to my webinar on this subject. Also, please take our survey regarding our blogs; I’d love to see your thoughts and suggestions. That’s interesting. 40years ago I asked what flow rate should I use with 60um flash silica and was told to use 80% of the flow rate used for 5um analytical hplc and scale according to cross sectional area. I stuck to this for years. Our automated flash systems tend to use a much higher default flow rate which is fine for easy separations but when it’s a bit difficult I always go back to the lower flow. I don’t know the internal diameter of your columns but I guess the 5ml/min flow is much the same as my preferred flow and it’s nice to see this is justified. As for smaller particle sizes on a flash system, we have 15um available and I use 100% of the flow rate used for 5um analytical hplc. When the columns are quite long, say about 24cm, then the back pressure is about the maximum for our system so there is no option to go faster. Forty years ago I was just getting my feet wet learning chromatography and so was the technology/science around it – much has evolved since those early days. Scaling load based on cross-sectional area ratios works but, as you too have seen, flow rate will not scale linearly. So, matching linear velocity is the way to go. Smaller particle media tend to have a higher optimal linear velocity and a wider flow range where good chromatography is achievable and likely accounts for your success using flow rates (velocities) similar to those used with 5um media. Previous Previous post: How can I make purification of hard-to-separate compounds greener? Next Next post: How can I perform normal-phase and reversed-phase column chromatography on one flash system?